Sam Houston State University has been recognized by the Corporation for National and Community Service and the U.S. Department of Education for its commitment to community service and service-learning. 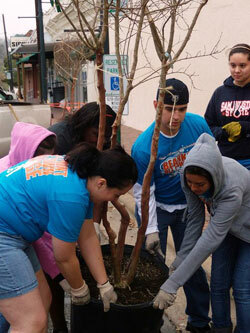 SHSU was named to the 2012 President’s Higher Education Community Service Honor Roll for its contribution of more than 600,000 hours of service, worth over $8,150,000. This is the second time in two years the university has received national recognition for community engagement. SHSU was awarded a “Community Engagement Classification” by The Carnegie Foundation for the Advancement of Teaching last year. “The Honor Roll designation is further validation of the significance and impact our faculty, staff and students have on the quality of life in our community,” said SHSU President Dana Gibson. “We understand that the community is home to our university, many of our faculty and staff, and to our students for the time during which they are working toward their academic goals. We want to be responsible citizens and improve and contribute to the quality of life for those who have provided us a place to live and work. Community engagement has become an expectation for students who are members of student organizations, including fraternities and sororities, honors programs, athletic teams, student orientation programs, and learning communities, according to Joyce McCauley, an engaged scholar and professor in the College of Education. “It is also incorporated into academic curriculum through more than 100 courses, across all six colleges, which have earned the special designation as academic community engagement courses — classes in which community engagement is tied to the course learning objectives,” she said. McCauley also noted the way SHSU has provided institutional support for community activities, including financial allocations, faculty recognition, and awards. “SHSU truly models the way community engagement is incorporated into a learning culture to positively impact the quality of life,” she said. “Preparing students to participate in our democracy and providing them with opportunities to take on local and global issues in their course work are as central to the mission of education as boosting college completion and closing the achievement gap,” said Eduardo Ochoa, the U.S. Department of Education’s assistant secretary for postsecondary education. The President's Higher Education Community Service Honor Roll recognizes higher education institutions that reflect the values of exemplary community service and achieve meaningful outcomes in their communities. Inspired by the thousands of college students who traveled across the country to support relief efforts along the Gulf Coast after Hurricane Katrina, the initiative celebrates the volunteer spirit that exists within the higher education community. The Corporation for National and Community Service, which has administered the Honor Roll since 2006, admitted a total of 642 schools to colleges and universities for their impact on issues from literacy and neighborhood revitalization to supporting at-risk youth. Of that total, 513 were named to the Honor Roll, 110 received the recognition of Honor Roll with distinction, 14 were identified as finalists, and five received the Presidential Award. For a full list of recipients, visit www.NationalService.gov/HonorRoll. The corporation is a partner with the nation’s colleges and universities in supporting community service and service-learning. Last year, CNCS provided more than $200 million in support to institutions of higher education, including grants to operate service programs and the Segal AmeriCorps Education Awards for college tuition and student loan repayment. CNCS is a catalyst for service-learning programs nationwide that connect community service with academic curricula. Through these programs, college students serve their communities while strengthening their academic and civic skills.